Praying with others for revival in an isolated mountain cabin, a woman member from Shinshiro Church saw a vision of KOSHIEN, Japan's largest baseball stadium, filled with believers who were praising and worshiping the Lord Jesus. Late at night, about 11:00 on February 13th, 1992, Pastor Jun Takimoto, a group of young people and some staff members of the small Shinshiro Church held late-night prayer meetings in the same mountain cabin where the vision for Koshien had been granted. Suddenly, The sound like that of a tidal wave, a tsunami, came toward us, said Pastor Takimoto. He felt a rush of incredible POWER coming towards them and intuitively knew God was responding to their prayers for revival. As the roaring sound and wave of power entered the room, one woman fell onto the concrete floor as though she'd been flung against it, and lay still as if dead.When her body moved and touched the foot of another person, instantly,almost everyone was knocked onto the floor in the same manner. There was almost an impression of windows shaking and rattling. One woman said the entire place seemeddis-attached from the ground. With fear and awe in their hearts, the prayer group drove back to their church sensing the wave following the car. Arriving at 2:00 am they telephoned the other staff members who were knocked down as they entered the sanctuary. Pastor Takimoto concluded, Nobody laid hands on anybody, and nobody had intentionally prayed for this to happen. It happened simply one-way, by God's hand--before we knew it we had been praying until morning. 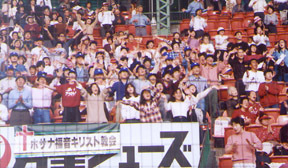 Those people who were touched by the Holy Spirit were completely changed and began to work in the midst of great difficulties with great sacrifice, to plan a Revival Meeting at Koshien Stadium. The Koshien's Mission Crusade's three days of seminars and conferences and three nights of powerful messages by Japanese Evangelists made spiritual history. There was no focus on a foreign speaker, and the enormous cost was funded by Japanese believers. The evening meetings, alternating with 15 minutes of praise and worship, ministered to approximately 124,000 people and 20,000 came forward to register a profession of faith in Christ Jesus. Registering Prayer Warriors and Fasting Prayer Warriors. The Goal is 100,000 Hours of Prayer. All Japan Revival Mission has provided Praise and Prayer Revival Meetings in fifty-five prefectures (states) in the nation of Japan, special Revival Children's Camps, Spiritual warfare and Church Growth Seminars, as well as 24-hour prayer vigils. Believers also take Revival Prayer Rides on trains throughout the nation, as well as in and around other major cities. 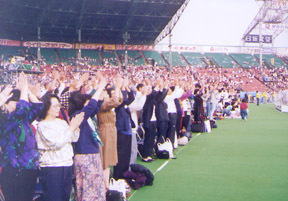 In September of 1998, All Japan Revival Mission sponsored a 10 day Tokyo Revival Mission recruiting hundreds of churches to pray hundreds of hours during a 40 day pre-crusade time of fasting. Volunteers also delivered Christian literature to 3 million homes in Tokyo, while some 1,000 people conducted evangelism outreaches and handed out another 1 million tracts. An estimated total of 56,000 non-believers attended the Crusade arena during 10 nights. By the Crusade's end nearly 6,000 has accepted Jesus, and a new found unity was struck between Evangelical, Charismatic and Pentecostal leaders--a decisive factor in the Crusade's success. In 1995, Minoru Okuyama, Pastor and former missionary to Indonesia, helped organize the Nippon Revival association, a fellowship for Charismatic and Pentecostal Japanese church leaders including evangelicals who know about the Holy Spirit. Source: Pastor Jun Takimoto, All Japan Revival Mission Newsletter, June 1996.